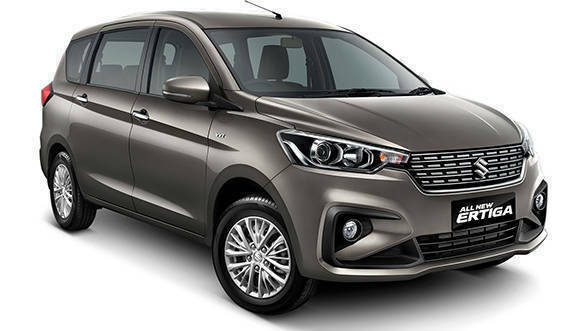 Maruti Suzuki has announced today that bookings for the new, second-generation Maruti Suzuki Ertiga have begun as of today, November 14. 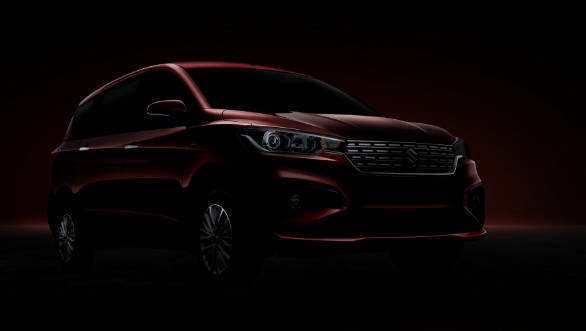 The car will be launched on November 21. Buyers can book the Ertiga at the Maruti Suzuki Arena dealerships for a booking amount of Rs 11,000. 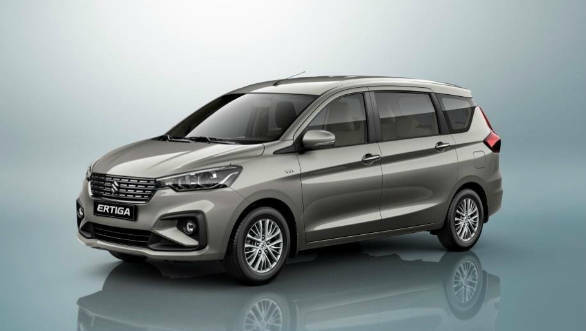 Speaking of the new Ertiga's design, the front fascia is completely new and now comes with wider double-barrel trapezoidal projector headlamps. The grille is now slightly larger as well and has heavy chrome detailing. The front bumper is more aggressively styled with a few prominent creases around the foglamps. The bonnet contouring looks to have changed as well. The side profile sees few changes and the basic shape follows that of the earlier car. The major change is the third-row glass area which is now larger and has a blacked-out panel to reduce the visual mass of the rear end. Like the front, the rear is completely redesigned as well. The biggest change is the LED taillamps, these are now larger and look very similar to the ones on the Honda WR-V. The rear windscreen is more raked than before and sits on top a new tailgate design as well. A chrome strip runs across the length of the tailgate while the bumper is a slim design which barely juts out of the body. The car gets a redesigned interior as well, larger than the outgoing car. While it shares a number of components with the Swift and Ignis, the overall design of the dash is new. The colour scheme is a beige and wood deal. 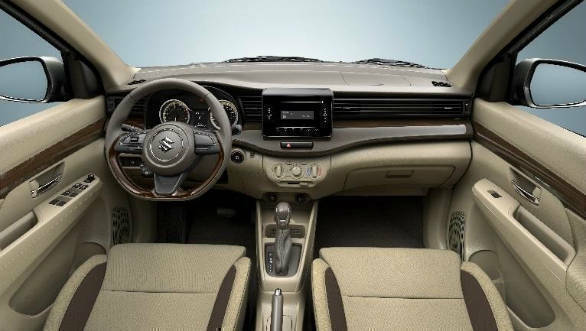 The top half is finished in grey and comes with vertical AC vents with horizontal lines running across the entire dash length on either side of Maruti's touchscreen infotainment system. Equipment levels will mimic those of the 2018 Maruti Suzuki Swift closely. 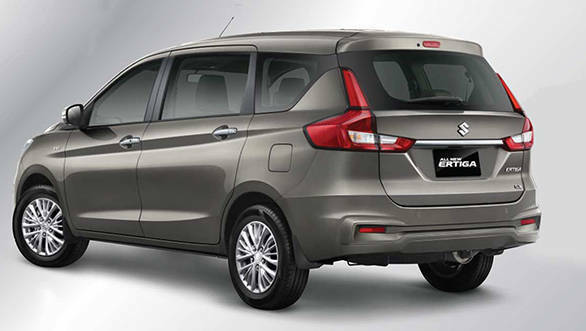 Mechanically, the most significant addition to the new Ertiga is a new K15B 1.5-litre petrol motor. This puts out 104PS and 138Nm. Increases of 13PS and 8Nm over the current car. This will be paired with either a 5-speed manual or 4-speed auto. In India, the 1.3-litre diesel motor should also be available. The car is based on the Heartect platform that also underpins the Swift, Baleno and Ignis. Fuel consumption for the Indonesian market model is rated at 18 kmpl for the manual and 16.7 kmpl for the automatic. The car sits on 15-inch alloy wheels. Dimensionally the new Ertiga is quite larger than the current car. The new car is 130 mm longer, 40 mm wider and 5 mm taller than its predecessor but the wheelbase remains the same at 2740 mm. The Indonesian-spec car has 180mm ground clearance but this will probably increase by 5mm for the Indian version. Boot space is 153 litres (up 18 litres from before) with all seats up, expandable to 550 litres (up 50 litres) with the third-row seats folded and 803 litres (up 68 litres) with all rear seats down. Maruti Suzuki has revealed that the Indian car will come in five colur options. The first of these is the new Auburn Red shade seen above, alongside this the MPV will be available in Magma Grey, Oxford Blue, Arctic White and Silky Silver. In terms of variants, the petrol Ertiga will come in Lxi, Vxi, Zxi and Zxi+ trims. The auto will be available on the Vxi and Zxi trims. The diesel will be availble in Ldi, Vdi, Zdi and Zdi+ variants. See the car's feature highlights here. Pricing hasn't been announced yet but expect a Rs 20,000 to 30,000 hike over the current car's Rs 6.81 lakh to Rs 8.71 lakh price range.